@mods: not sure if this is the right forum, so please feel free to move. 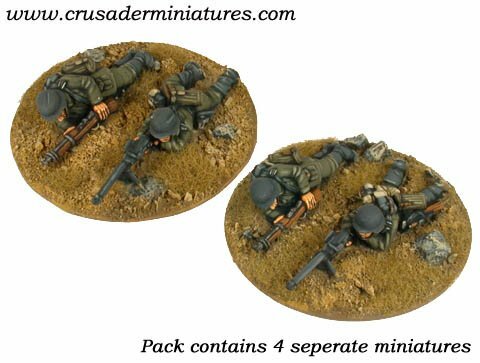 As discussed in the Bolt Action Slow-grow league thread (linky), I am planning to do a bit of online purchase at Crusader Miniatures (http://www.crusaderminiatures.com). If anyone is interested to join, please let me know in this thread. Postage according to http://www.crusaderminiatures.com/payment.php is "25% on all products to USA/Rest of World. Minimum charge £5.00". I'll use the price as ratio for calculating postage. E.g. if postage is £5, I'm purchasing £15 and Joe's purchasing £5, then I'll be paying £3.75 postage and Joe £1.25. Currency conversion will be based on the day I made the purchase (will put it up). Hopefully the exchange rate with mastercard is not that painful. Not limited to WW2 minis. As long as you're looking from Crusader minis website, go for it. I'm planning to put up the order after Christmas (probably this weekend), so delivery is expected around mid/late-Jan. Will do drop-offs at Outpost or CBD (workdays). Any suggestions on how/when/etc purchasing are welcome, as this is the first time I'm buying stuff from Crusader minis. Last edited by itchmonkey on Tue Dec 22, 2015 11:28 am, edited 3 times in total. No worries Dave. List updated. With my new focus... I no longer need my FJ PAK36. No worries Mikey. Is the Heer AT rifle the one below? If yes, that's the same one as what Dave and I wish to get (WWG013 German PzB39 - £5.60). Probably. But the image won't show up at work either. I'll let you know, but I am pretty sure that is the one. 2 teams, so 4 little toy men. Actually chuck me down for the LMG pack as well. Last call for boarding...I will do the order tomorrow morning.